If you step out doors on a clear night and look up as the sky, technically you are already a stargazer! But stargazing as an exciting hobby entails a lot more than just a casual glance skyward. It’s a never-ending cosmic adventure that you can embark on simply by following the three basic steps discussed below. Unfortunately, newcomers to the hobby often make the mistake of jumping ahead to the last of these steps first. Step One: First and foremost, is becoming familiar with the appearance of the night sky with just the unaided eye alone—the prominent stars and constellations of each season, along with the locations of the brighter planets. In past installments of Sky Talk we’ve discussed using the familiar Big Dipper as a pointer to the constellations of spring and early summer, and radiant Orion as a guide to the fall and winter ones. Of the 88 officially-recognized constellations, all or part of 66 of these can be seen from mid-northern latitudes. And every one of them can be found using either the Dipper or Orion as pointers! But by far the best way to learn your way around the sky is by using the wonderful and inexpensive Scientifics Star and Planet Locator, which can be set for any hour of the night for any night of the years (see www.scientificsonline.com). Step Two: You are now ready to extend your explorations further by using binoculars. Yes—binoculars! Few realize that these humble glasses are wonderful stargazing instruments in addition to their traditional uses. They will show the craters and mountains on our Moon, several of Jupiter’s four brightest satellites, wonderful views of big star clusters like the Pleiades, several of the brighter nebulae like that in Orion, and even galaxies such as that in Andromeda. For sweeping the glorious vast star-clouds of our own Milky Way Galaxy, they are unsurpassed. And let’s not forget eclipses of the Moon nor the brighter comets or artificial satellites like the International Space Station. Step Three: After exploring the sky with the naked-eye and binoculars, you will ultimately want to get a telescope. This an involved and often confusing endeavor for beginners, and many books have been written on the subject—including my A Buyer’s & User’s Guide to Astronomical Telescopes & Binoculars (Springer). Here are a few helpful hints to consider. There’s an old rule-of-thumb that “the smaller the telescope the more often it will be used.” This relates to both weight and complexity. And avoid cheap so-called “department store telescopes” made largely of plastic and inferior optics. It’s far better to begin with a small basic telescope of good optical and mechanical quality than some huge white elephant that ends up sitting idle most of the time. Then as interest and ability grow, you can always upgrade to a larger instrument if desired. 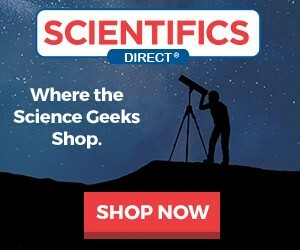 Scientifics offers a number of great beginner’s scopes to get you started (as well as larger advanced instruments for more experienced stargazers.) 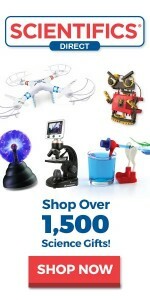 Next month: sights for small telescopes!